The 2017 Nobel Prize in Physiology or Medicine was awarded equally to Jeffrey Hall of the University of Maine in Orono, Michael Rosbash of Brandeis University in Waltham, Massachusetts, and Michael Young of Rockefeller University in New York City, for their work on how several genes work together to control the body’s circadian clock. Globally, their discoveries explain how plants, animals and humans adapt and co-ordinate their biological rhythm so that it is synchronized with the Earth’s day / night cycle. Understanding the circadian clock is also necessary to understand how organisms coordinate various components of their metabolism throughout their body, such as the rise and fall of hormones or the importance of sleep or memory formation. The scientists used fruit flies to identify genes that when mutated alter the circadian rhythm. They identified the biochemical components made by those genes, the RNA and proteins, and described their regulation to understand the mechanisms that maintain that cellular clockwork which gives rise to the circadian rhythm. Circadian rhythms are common to all organisms, from very simple single-celled algae through to humans. It’s a basic physiological process of great importance that helps the body keep itself regulated with the passing of the day. The whole system affects sleep, behaviour, hormone levels, body temperature and metabolism and many other fundamental aspects of life. The presence of a biological clock was already described as early as the 18th century. French astronomer Jean Jacques d'Ortous de Mairan discovered that the mimosa leaves opened at dawn and closed at dusk, and then in 1729 he showed that the plant continued this cycle even when kept in darkness. But it wasn't until the 20th century that the idea of an internal clock - as opposed to rhythms being externally controlled by daylight- was settled. How it worked, however, was a mystery. Early clues to the genetic basis for a daily physiological cycle were discovered in mutant fruit flies in the 1970s. Researchers isolated a gene called period, that controls the normal daily biological rhythm. Young, Hall and Rosbash separately managed to sequence the gene in 1984. Hall and Rosbash also showed that its protein, called PER, rose and fell over 24 hours, peaking at night and degrading over the day. They suspected the clock was driven by a feedback loop, with high levels of PER interfering with period and inhibiting its activity, which would cause the levels to subside. But to do so, PER, made in the cytoplasm of the cell, had to get into the nucleus. Young figured out how that worked. In 1994, he discovered a second clock gene, timeless, that made a protein whose abundance cycled over 24 hours. 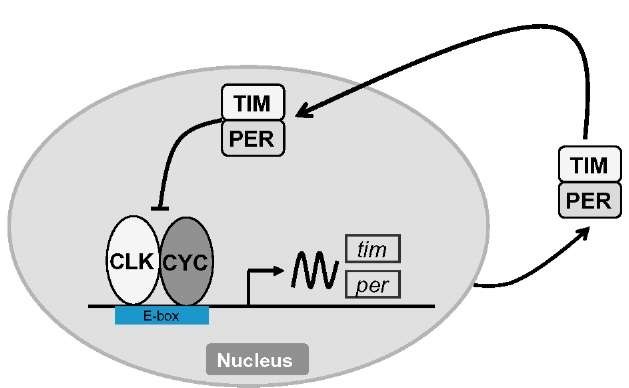 When the timeless protein TIM hooked up with PER, they could enter the nucleus to inhibit period. The research exposed the mechanism governing the self-sustaining clockwork inside the cell. Scientists now recognize that biological clocks function by the same principles in cells of other multicellular organisms, including humans. The circadian rhythm is important for the basic understanding of life, as all organisms respond to the sun and their behaviour is determined by the light-dark cycle. It is therefore embedded in most functional metabolic mechanisms of life. Wellbeing can be easily affected when there is a temporary mismatch between our external environment and this internal biological clock. Since the discoveries by the three laureates circadian biology has developed into a vast and highly dynamic research field, with implications on human health and wellbeing. This is especially true since the modern technological age tends to distort and even remove normal time and light patterns. The consequences of lifestyles that disturb circadian rhythms are still being found, but there is clear evidence that shift-working causes changes to blood pressure and heart function. This is just one example of where mismatched circadian rhythm is associated with increased risk for various diseases, and that the treatment of diseases in general can be influenced by circadian rhythms too. Understanding the links between circadian rhythms and good health is built on the discoveries in fruit flies that were made by Jeffrey Hall, Michael Rosbash and Michael Young so many years ago.